Commentators on Japan’s recent Lower House election might be tempted to claim that Abe won a victory but not a mandate. However, the concept of “mandate” is highly contested in the study of politics. It frequently arises in the aftermath of an election when governments claim to have mandates to enact particular policies and opponents challenge the extent to which voters had actually supported those policies. Governments often use the size of their majority or the salience of particular policies they espoused during the campaign as evidence of the strength of their mandate. From this perspective, whether or not individual voters actually determined their vote on the basis of the policy in question is beside the point. The concept of a mandate has value in linking what governments do to what they said they would do – a basic principle of representative democracy. Hence, the relevant measure of the extent of the mandate given to Prime Minister Shinzo Abe and his ruling Liberal Democratic Party is the content of their election manifesto and the oral statements and commitments they made during the campaign, not the strength of their election victory. In this context, it is, therefore, irrelevant to point out that votes won by the LDP as a percentage of the total cast and eligible vote in all single-member districts (SMDs) and proportional representation (PR) constituencies amounted to 48 percent of cast votes in the SMDs and 33 percent in the PR blocs, but only 25 percent of eligible votes in the SMDs and 17 percent of eligible votes in the PR districts, giving the LDP the support of just one quarter or less of eligible voters. the most important issue was reducing the number of Diet seats, which voters wholeheartedly supported. To gain a clear idea of the current Abe administration’s mandate, therefore, we need to check the LDP’s manifesto. Perhaps the most important policy commitments are: pushing ahead with economic policies under the rubric of Abenomics; submitting a revised draft constitution to the Diet, and conducting a national referendum on constitutional revision; revitalizing regional economies; restarting “safe” nuclear power plants; providing more jobs and higher wages; pushing for women to play an active role in the economy; fiscal reconstruction; reviving education; contributing to the global environment; pursuing reform of the agricultural cooperatives; protecting what should protected in the TPP negotiations; and pushing ahead with national security legislation to implement the cabinet decision allowing the exercise of the right of collective defense, particularly in order to defend Japan’s territorial waters around the Senkaku Islands in the East China Sea. Certainly in response to the election result, Abe made it clear that he regarded himself as having received the Japanese equivalent of a “mandate” to develop national security legislation to implement collective defense. He stated, “I included it in our manifesto, and I understand that I gained [the people’s] understanding. The [Constitutional] interpretation was changed in July, and this election took that into account.” Abe also claimed that his victory in the election was a mandate to accelerate his economic policy, which includes introducing more competition into agriculture and pushing ahead with Japan’s entry into the TPP. 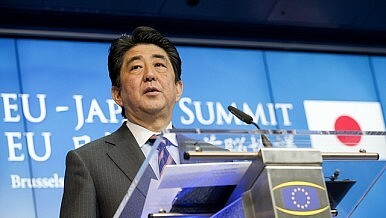 Abe demonstrates that he is operating according to a common understanding of mandate adopted by elected governments: He and the LDP have the right to enact policies that they took to the electorate in the campaign, a right that does not depend on voters’ policy preferences but on whether the policy figured in the party’s election policy. He is not necessarily claiming that all those who voted for the LDP actually chose the party because their own policy preferences most closely matched the LDP’s, but because the LDP’s election manifesto publicized what the party’s policy intentions were. From the point of view of Abe’s mandate, it does not matter, therefore, that he focused almost the entire campaign on Abenomics and mostly ignored other more contentious issues such as constitutional reform and restarting nuclear power plants. The failure to debate substantive issues such as these in the election campaign demonstrates the capacity of the Abe government to dictate the narrative. Dominance over a generally conservative media and weak opposition parties enabled Abe and his cohorts to manipulate the campaign to their advantage. Japan has ended up with a government that opinion polls suggest a majority of Japanese are not even sure they want. A Kyodo News Service post-election poll found only 27 percent of respondents expressing satisfaction with the election results (slightly above the LDP’s percentage of the total SMD vote), tied with the 27 percent expressing dissatisfaction, with 45 percent undecided. It is clear, however, that Abe has secured not only victory but also a mandate for all the LDP’s declared policy pledges and can be expected to continue to use this as an argument for advancing these policies during his new administration. Certainly he and his party have gained considerable policy momentum from the election. Aurelia George Mulgan is professor of Japanese Politics, University of New South Wales, Australian Defence Force Academy, Canberra, Australia. Author of six books on Japanese politics (the latest “Ozawa Ichiro and Japanese Politics: Old Versus New,” Nissan/Routledge 2014).